If you spend a lot of time outside during the winter you need good insulating layers. Really cold days with long belays become "two-puffy days". On "two-puffy days" I typically wear one slim-fitting lightweight puffy and one heavier belay jacket. The lighter slim-fitting puffy jacket is generally thin enough to wear while leading hard pitches and packable enough that it can fit in my pack as an emergency layer all the time. 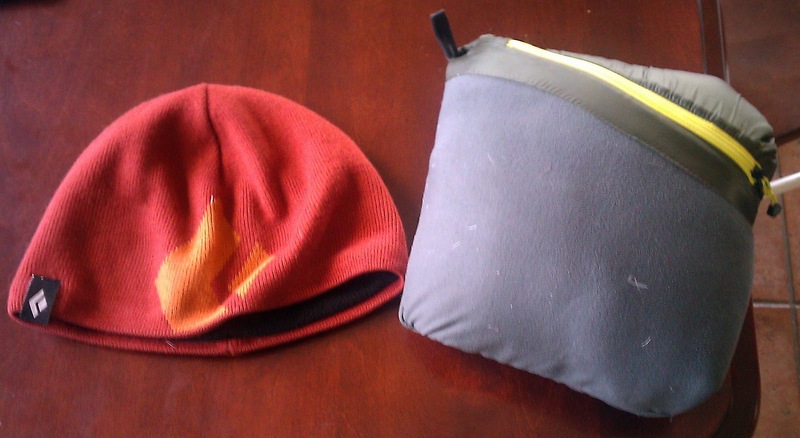 Over the past few years I've carried the Wild Things EP Jacket or the OR Fraction Hoody. 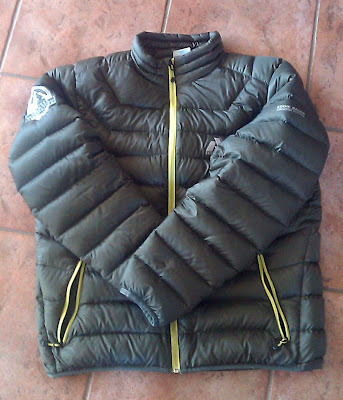 Both of these garments were hooded lightweight Primaloft layers with a straight-sided, billowy fit. I still use them when I want a hood, or when the forecast calls for wet weather. If the forecast is for colder or drier weather though, my insulating underlayer of choice right now is the Eddie Bauer First Ascent Downlight Sweater. How did I choose the Downlight Sweater? I didn't, it was given to me. Prior to my AMGA Advanced Alpine Guides Course all of the participants were given a big bag of First Ascent gear. Eddie Bauer First Ascent has partnered with the AMGA and provides alpine course candidates with clothing to use during the program. I was given a 30 Liter pack, a full 3-ply shell outfit, long underwear, a fleece hoody, and the Downlight Sweater. First Ascent has only been producing technical outerwear for a few years. As you would expect, the fit of their garments is still hit-or-miss. Some of the garments were too generously cut to fit well for climbing. Others, like the Downlight Sweater and Hangfire Hoody, have become staples in my everyday outerwear wardrobe. The Downlight Sweater has a Euro-style cut which makes it a great 3-season belay jacket and a perfect insulating underlayer on really cold winter days. So far I've led rock routes and mixed routes up to M7 wearing the jacket, and used it as an underlayer when the temperature dips below twenty degrees outside. With a slim and flattering cut, this layer goes everywhere with me. The highly compressible 800-fill power Downlight packs really well into the empty space in my Cold Cold World Ozone, making it a perfect emergency layer. Little additions like the fleece lined pockets make this a great around town jacket too. The durable YKK zippers also feel like they'll last through several seasons of use. At $180, the Downlight Sweater is competitively priced. Still though, it isn't cheap and one pitch of rough rock could trash it. If you're careful this garment should last several seasons, and unlike Primaloft or Polarguard, the down won't lose it's loft as quickly. So, the next time you're looking for a new puffy layer, don't forget to consider the First Ascent Downlight Sweater and Hoody.